Through your purchase of a leaf or an acorn, Friends of Animal Services, Inc. can support the Pasco County Animal Shelter with donations that provide funding and material items which enhance the health, welfare and environment of the sheltered animals. 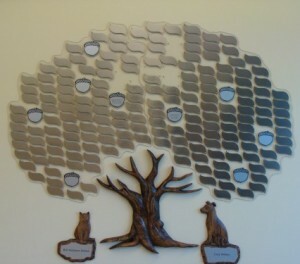 The Giving Tree is proudly displayed in the lobby of the new Pasco County Animal Services Facility. Acorn Donation is $500 – SOLD OUT! Each line is limited to 25-28 characters each. Please select your option below via PayPal. Please send your preferred inscription to info@fpcas.org Note that your acorn or leaf purchase is an independent transaction – send us the details of your inscription and we will confirm your purchase and order your acorn or leaf. Let us know if you have any questions! Thank you for your donation!